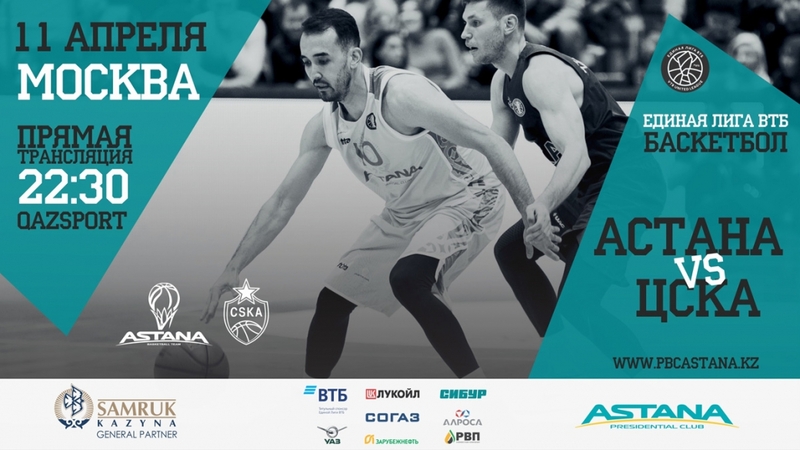 On Thursday, April 11, in Moscow, a game between «Astana» Presidential Basketball Club and «CSKA» Moscow will be held in the regular season of the VTB United League regular at the sports arena CSKA. CSKA - is a Russian professional men's basketball club from the city of Moscow, founded in 1923. In addition to participating in the VTB United League, they perform in the Euroleague. The teams have already met in the current season in Nur-Sultan on October 7 last year, while the “CSKA” won the capital team with a score of 61:86 (15:14, 12:27, 20: 24,14: 21). Today, the Moscow club «CSKA» stands first, and the capital club «Astana» takes the fifth place in the standings of the VTB United League. If the capital basketball players can impose a struggle on the red-and-white squad and make another historic event will be known this Thursday, April 11th. Live broadcast of the match will be available on Qazsport and on our website in the Match Center section, starting at 22:30 Nur-Sultan time. We remind you that the tickets can be purchased for the following home matches of the team against «Lokomotiv Kuban» on April 15 and «Enisey» on April 21.